In 34 B.C. the Romans founded Norda Caeserina, the city that we know now as Cáceres, a city with almost 100,000 inhabitants in the province of Cáceres in Extremadura, Spain. For a long time Cáceres was a very influential city for the southern part of Extremadura. A city that also was place of great strategic importance, and therefor it was taken and re-captured a couple of time in the reconquest in the 13th century, before it was taken back by the Christians for good in 1229. The big attraction in Cáceres is the old city (listed as an UNESCO world heritage site) The old city of Cáceres can be compared with the old city of Toledo, but only less touristic. The ciudad monumental is the old part of Cáceres and it is walled. Most of the towns monuments can be found in this part. Only the large Plaza Mayor and the Iglesia de Santiago de los caballeros are outside of this area. The leaflet of the city council of Cáceres about the old city, lists no less than 68 sights in and around the monumental part of the city. This list might be a bit long, but there is more than enough to see in the city. The Plaza Major is a long square surrounded by beautiful white houses. The Plaza is the place where you most likely see something of the Old city from nearby. In the galleries under the houses you can find enough places to have a drink or something to eat. On the eastside of the square you will see the citywalls and the towers of the old city. 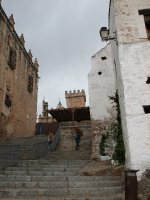 Here you will find the stairway that leads up to the Arco de Estrella (the Gate to the city) where you can get into the walled part of town. When you have entered the city through the Arco de Estrella, and followed the small street, the first square you will find is the Plaza de Santa Maria. 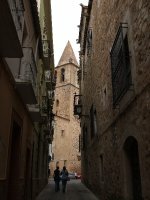 When you enter the square the first thing you will see is the 16th century Iglesia Concathedral de Santa Maria, which is a mixture of Roman and Gothic buildingstyles. Highlights are the main altar, which is mainly made of wood, and dates back to the 16th century. On the rightside of the altar, is the Chapel of the black Jesus. On some special occasions this statue is carried in processions, through the streets of Cáceres. On the leftside of the church you will see the Palacio de Carjaval. Most of the other buildings surrounding this square also dates back to the 16th century. At the Plaza de las Veletas we find the Palacio de las Veletas, which now houses the museum of Cáceres. Here we also find the Iglesia de San Mateo, which is built on top of an old mosque, and many other old buildings. In the small museum of Cáceres you will also find the only remaining parts of Moorish Cáceres. In the basement, you can find the 'Aljiba'. A series of Arches dating from the Moorish era. The rest of the museum is mainly occupied by archeological finds, dating back to prehistoric times. The museum is opened almost every day. (on Sunday only in the morning.) Entrance is free for E.U. citizens. The Hermita de San Antonio is a lovely small church. The oldest part of this church dates back to the 13th century, but it was finished in the 18th. It is rumoured that it helps if you come here and ask the divine one to hook you up with a nice girl or boy. You can wander around the old city for most of the day, and see lovely places without always needing to know what's what. The oldest part of the city you will find on the eastside of the old town. The Arco and the Torre de Cristo date back to the first century A.D., while the Torre de la puerta de Concejo was built in the second century. On the northside of the old town the city walls were removed, and just outside the place where once the walls should be you will find the Plaza de Santiago, with the beautiful Iglesia de Santiago. On the otherside of the old town, on the southside, and also just outside the citywalls you can find the Convento de Santa Clara. 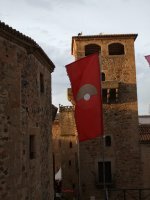 The WOMAD (World Of Music And Dance) festival, a festival organised by Peter Gabriel, with a lot of world music comes to Cáceres every year in early May. The festival takes place at the Plaza Major, Plaza San Jorge and the Plaza de las Veletas. Besides the music, there is the possibility to taste a lot of foods from all over the world, and there also in a big market at the paseo de Cánovas, a street not far away from the Plaza Major. Extremadura has a small airport near Badajoz, which is only served by Air Nostrum, a sister company of Spain's national carrier Iberia, the only international destination served is Paris (Orly). You can also get to Cáceres from Madrid, Barcelona and Valencia. An other option to go to Cáceres is to get to relatively close airports, like Seville. But in most cases it best to go via either the international airports at Madrid or Lisbon and continue by train or bus from there. There are train connections to Cáceres. From Madrid a train travel takes around 3-4 hours. Check the Renfe website to get a precise idea about the time and expenses to travel to your destination. The duration of the trip, and the price can vary a lot, as the route is operated by a couple of companies. It is also possible to reach Cáceres by train from Portugal. The train station is at the southside of the city, a 15-minute walk away from the city centre. On the other side of the street you will find the bus station. You can get around the modern part of the city easily by car, but it is not smart to drive the car into the old part of town. 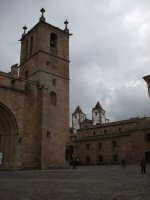 There are a couple of city buses that can take you around Cáceres, but in general everything is within walking distance. Going by foot is the best way to see Cáceres, and the only way to see the historic part of town. There are a lot of stairs in the old city, but at the tourist information they can also point you out which streets you can visit without the need of climbing stairs. As is the case everywhere in Spain, you will find many bars all around town. One place that is a bit more special is El Corral de las Cigüeñas at Calle de Aldena 6. It is located just inside the walled part of the old town, and has a huge open space, that in summer serves as a refuge for many locals that seek shelter from the heat. On many occasions there are bands playing on Saturdays. Popular places that stay open until fairly late in the weekends, include Carpe Diem and Club Bugaloo. In the latter on some occasions bands are playing, or jamsessions take place. This is version 34. Last edited at 21:50 on Jan 10, 14 by Herr Bert. 9 articles link to this page.